Change of pace from the cats and dogs. This is a repost from August 25,2011. Billy Bob is still doing okay as of today. He is now about 12 years old. I don’t remember what year I rescued him from becoming cabrito. He was maybe 5 months old at the time. Brandi giving Billy Bob a bath . The following is a post dated August,2011 about Billy Bob my goat, so understand that this is not a recent happening. This past week has been rough for out pet goat. I noticed he was limping on his right front foot and when I examined his foot I found that the pad of his hoof was tender and swollen. From the large animal vet in our town I obtained a huge syringe of an antibiotic which I injected into the deep muscle tissue of his neck. The veterinarian’s instruction was, “wait a couple of days and see if the injection makes any difference.” Two days passed and by Thursday of last week his limp was the same if not worse. I then managed to wrangle our son and two of our welders to load Billy Bob into a large wire crate that was roomy and secure. The large animal vet was across town but Billy Bob made the trip without undue stress. Dr. J. gave Billy (2) antibiotic injections, an oral dewormer and then scraped around his infected hoof which allowed the “crud” to drain which helped reduce the swelling and infection. After our goat arrived back home, I moved him to the back yard where I was able to observe him more closely as well as soak the hoof in a solution of iodine mixed in water. I needed help to keep his foot in the bucket of antibiotic solution. It was quite a circus of three people holding a goat that had one foot in a red bucket as he munched on carrots. We could only keep his foot in the bucket for about 3-4 minutes but I was satisfied that at least the foot was cleaned and soaked at the same time. As of Wednesday, Billy Bob was limping slightly. He has been quite pampered with carrots, apples, alfalfa hay and goat pellets. He now shuns his costal bermuda grass hay. Billy Bob actually became spoiled in one day.I am happy to say that he appears much improved and seems to have gained a few pounds. He lost weight from being ill. The foot may have been infected for several weeks before I noticed that he was limping. 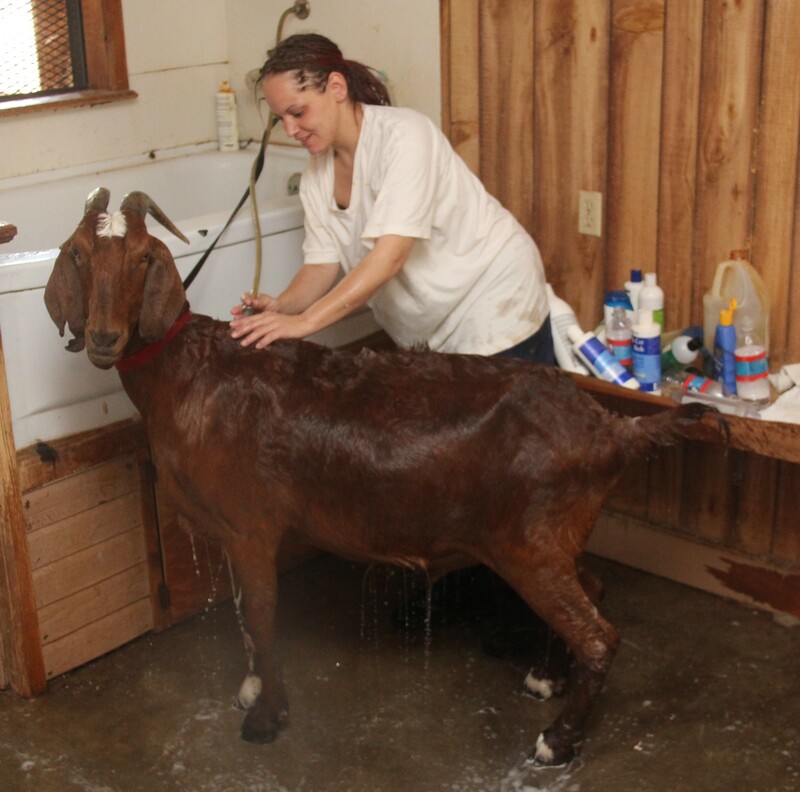 Last Monday my part time helper for special projects, Brandi, gave him a great bath.Of special note here, Brandi is not afraid of any animal whether she is working with a wayward dog, semi-feral cat, or a goat. She is much more talented than I when working with animals. Update: May 18,2013. Billy Bob continues to be spoiled and would hurt me if he could. He is special none the less to me and he will have a home with me for as long as he lives. Presently he is probably about 12 years old but I am just not sure of the year that I saved him from being barbecued. Gee I hate the word barbecue! Perhaps all or most of the viewers who are fond of cats are already familiar with Henri. Personally I find these videos hilarious and I hope that viewers of this video, will as well.